Great gift ideas! 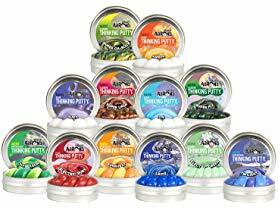 Today ONLY - Crazy Aaron's Thinking Putty - 12 Tins $22.99 (Retail $36). This bundle includes 12 awesome colors of thinking putty. •This isn't your grandpa's putty! Thinking putty incorporates amazing characteristics in each tin - Electrics, Illusions, Hypercolors and more! •Each putty comes in a 2'' tin and is 0.47 oz of fun!